India vs West Indies 2nd and last test match being played in Rajeev Gandhi International Cricket Stadium Hyderabad from 12 Oct 2018 to 16 Oct 2018. This is the 2nd match of West Indies tour of India Series. India has had won Ind vs WI 1st test 2018 and will try to clean sweep West Indies by winning Ind vs WI 2nd test 2018. Hi friends, I'm Gyan Ranjan, In this blog post, you will get Ind vs WI 2nd test cricket score live updates, match facts, and description of some interesting moments. The first and second session was in favor of India in which Indian bowlers did a great performance and taken 5 important wickets of West Indies. West Indies was at a time 113/5 but after that Rostan Chase and Jason Holder established the inning very well and reached the to 280/6 in 88 overs when Rostan Chase 88* and Jason Holder 50* were still on the crease. Kuldeep Yadav got 3, Umesh Yadav 2 and Aswin got 1 wicket in this inning. Braithwaite 14, K Powell 22, Shai Hope 36, Hetmyer 12, Sunil Ambris 18 and Shane Dawrich contributed with 30 runs and reached the score of West Indies to 287/7 in 90 overs. Jason Holder lost his wicket and scored 52 runs. It was the last wicket of today's match taken by Umesh Yadav. West Indies 287/7 at the stump of the 1st-day match. 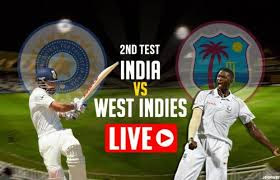 This is Ind vs WI 2nd test 2018 live cricket score of the 1st-day match. West Indies scored 311/10 in his 1st inning with the help of the best inning of Rostan Chase who scored 106 runs. Umesh Yadav did his best performance in this match and taken 6 wickets. Prithvi Shaw and KL Rahul started the inning for India. KL Rahul failed once again and could score only 4 runs but the man Prithvi Shaw once again played an amazing and blasting inning like T20 match. He scored 70 runs but faced only 53 delivery in which smashed 11 boundaries and 1 six. Pujara 10 and captain Virat Kohli contributed with 45 runs. Ajinkya Rahane 75* and Rishabh Panth 85* still on batting. Panth smashed 10 boundaries and 2 sixes in his 85 runs. Jason Holder got 2 wickets while Gabriel and Warrican got the 1-1 wicket. India scored 308/4 at the time of 2nd-day stump.